Ah, suede. Casual yet dressy, textured yet smooth. This buttery-soft material is irresistibly versatile and just a touch rugged. 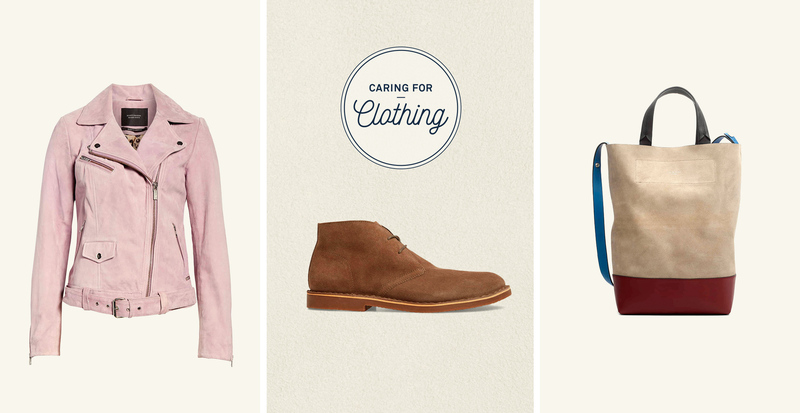 We’re big fans, if you haven’t noticed—and while wearing it makes us happy, suede requires a bit of care. Shoes and boots can be scuffed, jackets can attract stains, and handbags lose their luster if not properly stored. That said, all it takes is a few products and a bit of know-how to keep your suede pieces looking pristine. Whether you have a prized jacket to restore to its original splendor, or a great pair of boots that need some TLC, follow our care guide to ensure your favorites look their best for seasons to come. Always start with a protective spray, applying once before first wear and every few months—pop a note on your calendar so you’ll remember! Caught in the rain? Let suede dry naturally without forced heat, including direct sunlight. 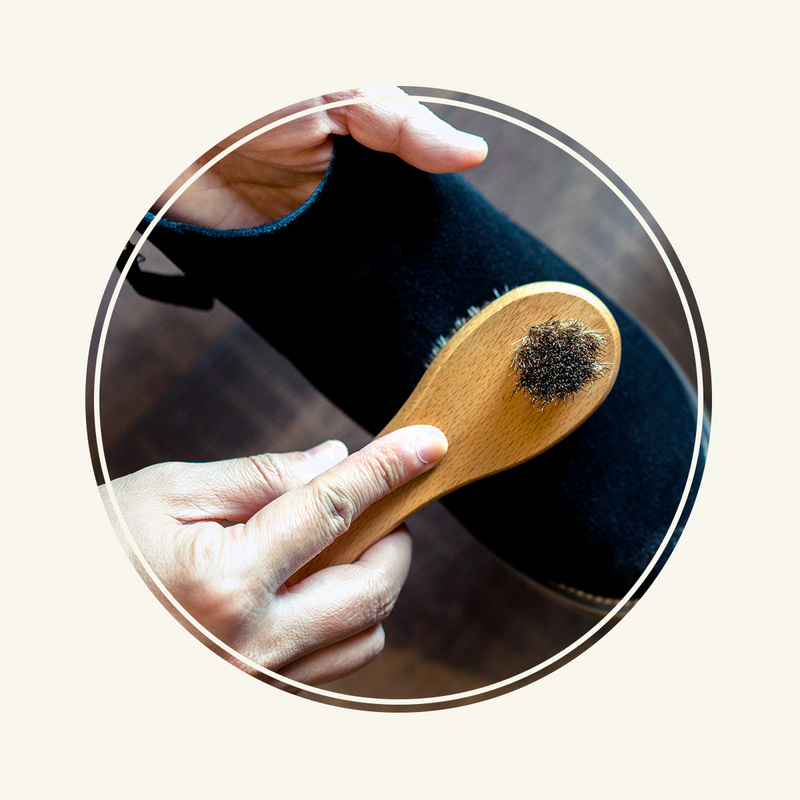 A suede brush will be your best weapon against a drab, dirty surface. Brush items in all directions to free up dirt and dust in a snap. With footwear, be sure to use shoe trees for daily storage to preserve their shape. Whew! Got all that? TIP: The collar of your suede jacket is susceptible to stains over time from natural oils in your hair and skin. It’s inevitable! Wear scarves over the lapel to keep oils and hair products from seeping into the material. A wet stain is enough to make a suede-lover run screaming to the cleaners. But first, try this: Dab the stain with a towel. Apply talcum powder or cornmeal over the stain and let it sit overnight. Brush it off in the morning. For dried stains (like the dreaded winter salt stain), use an emery board or kneaded eraser to remove as much as possible. Blot the stain with a bit of white vinegar. If you find your suede is still looking drab, give it a thorough brushing after holding it over steam for a few seconds. Is the item really looking rough? Take it to a pro. The way you store your clothing and accessories will impact how long they stay looking sharp. 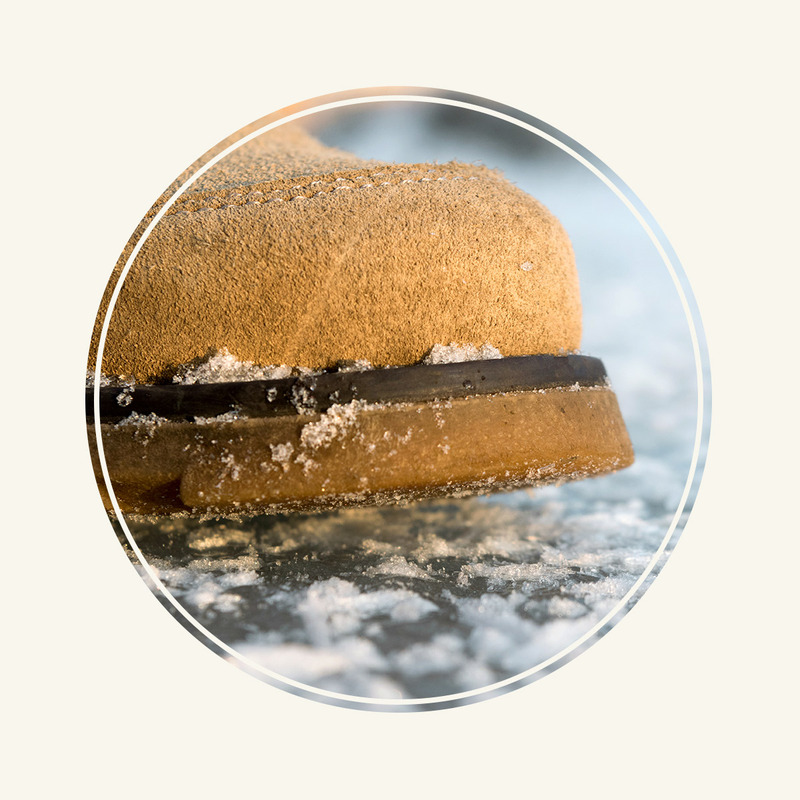 As with all vulnerable items, preserving shape and maintaining an even temperature is key. We already mentioned quality shoe trees for footwear, but you should also encase shoes and boots in dust-proof bags for extra protection. Store jackets in garment bags to keep dust and moisture at bay, but remember: opt for canvas over plastic. Suede needs to breathe. TIP: No dust bags on hand? A pillowcase works just as well to substitute for a breathable storage bag.